Nelkin Designs Blog: My Friendship Contexta and a New Expansion Pack! My Friendship Contexta and a New Expansion Pack! 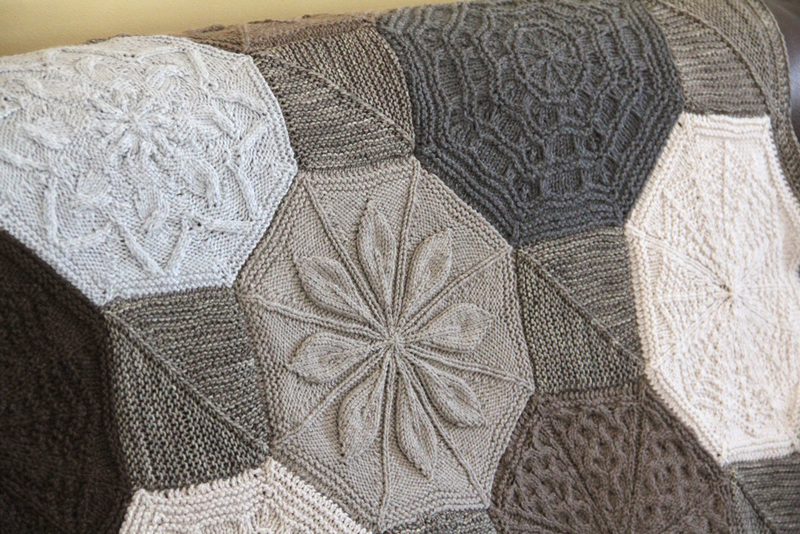 Last June after Knit Texture launched we had an Octagon swap for Contexta in my Ravelry group... I signed up to swap 13 Octagons and received 16 in return! The results of this incredible project are below.... read on! I designed a heart Octagon for my buddies, they were my summer/fall travel knitting, and went all over with me! 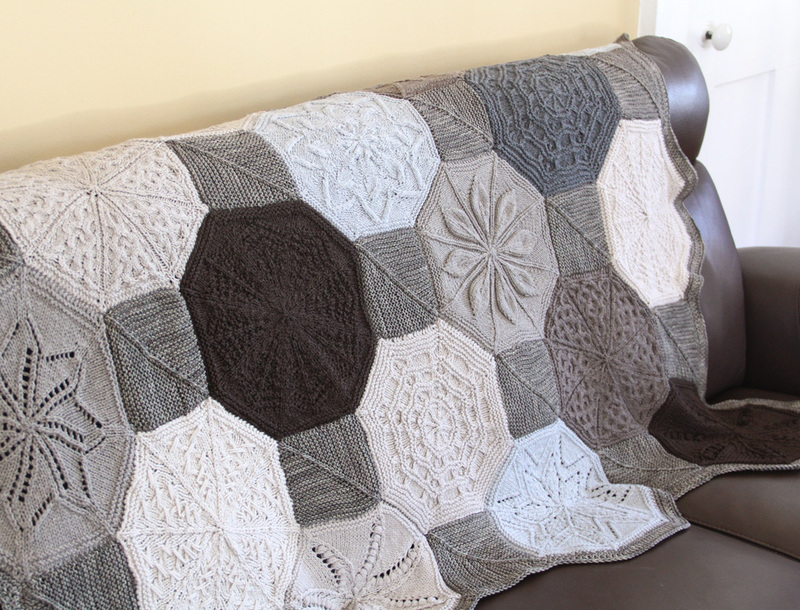 I knit Contexta Octagons everywhere... in Iceland, Ireland, Scotland, in Cayuga Lake (literally), camping and then went I got home I sent them all to their new homes. To ensure that everyone's Swap Octagons would go well together I had us all use Cloudborn Superwash Merino Twist in a select list of neutral colors... I just knew that with a swap our Afghans could lend up looking a wee bit disconnected if people could use any worsted weight yarn or color! I decided to knit all my squares and work the border in Jill Draper Makes Stuff Hudson in Petrified Wood. I am SUPER happy with my decision as I adore mixing this neutral hand-dye with the Cloudborn! HUGE Thankyou to: Carol, Kelly, Debbie, Debby, Kathy, Justine, Helene, Kathy, Kayleen, Laurel, Dawn, Chari, Susan, Lori, Susi and Crystal you have all helped me make one of my most treasured creations! We'll be snuggling together for years to come! Many of the swaps members got so inspired by the class, swap and pattern that they designed their own Octagons for the swap so people would know who knit them, how cool is that? As soon as people starting seeing each others designs they wanted to knit them, so we decided to put together an Octagon Expansion pack for Contexta with new Octagons from Carol, Kelly, Melanie, Simone, Chari, Debbie, and myself! That means that there are now 13 Contexta Octagon designs to choose from! Aren't these beautiful? I adore each and every one! 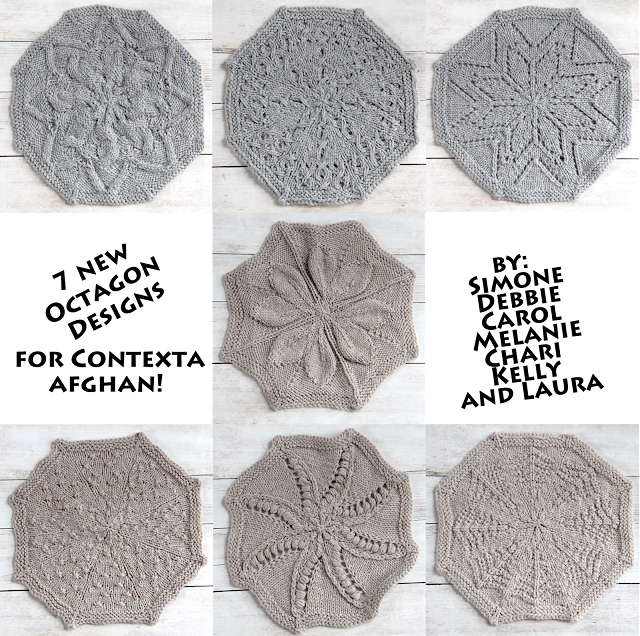 Note: These are only Octagon patterns, you will still need the complete Contexta pattern available in Laura’s Craftsy class Knit Texture. I am honored to have been able to make an octagon for your beautiful Contexta and equally as thrilled to have an octagon made by you in my Contexta. It was so much fun swapping and making it. Your classes and Ravelry group have expanded my knitting skills so much! I just bought the expansion pack and so love the fact that the money will be donated to good causes. Love this expansion pack - my Contexta has been on hold waiting for these lovelies. WOOT! Now you can get back to it... sorry it took so long : )! I love your Contexta and I'm so honored to be part of it. I am also very touched by this post and donation of money to some fabulous organisations. 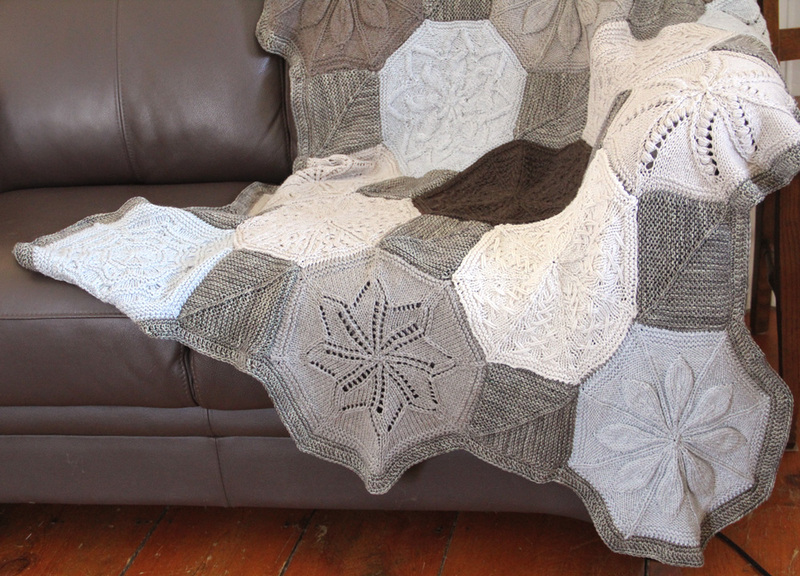 I will have to knit another Contexta with the expansion octagons. I love my Contexta too... and am SO happy you are a part of it! Laura, will you make your Heart Octagon available? Yes! It is one of the seven in the Expansion Pack! Such beautiful patterns, so much creative design, & true generosity! Everyone involved deserves a huge part on the back. Such deserving organizations. Thank you! As a recent ovarian cancer survivor, my huge thanks to all of the creative designers & the many knitters that have already purchased the Octagon expansion pack. Oh, thankyou for your sweet and heartfelt words Deirdre! You were of course on our minds when we chose a cause for the proceeds of the Expansion Pack! My Contexta has been on hold, but I'm now working to finish it. I am using the expansion pack to complete the octagons I still need. Thank you Laura for this wonderful piece of Frienship to cherish forever. I am honored to be part of this wonderful group and help with the good fight against cancer.